Mini-logos – Knights of the Round added to Capcom. Rush ‘n Attack (arcade/NES) added to Konami. Pac-Land added to Namco. Alien Syndrome added to Sega. Cyclops and Marvel Girl (original logos), Giant-Man added to Marvel. Harley Quinn added to DC. These mini-logos were also added to the GFX Generators in the logical places. Game Logos – Alien Syndrome, Blade Master, Knights of the Round (without the stone and sword), Rush ‘n Attack (arcade), ThunderJaws, Tiger Road, Time Soldiers added. Game Index – Besides some coding changes, The King of Dragons (arcade) was added. Custom Sprites – DNL added new sprites to his gallery. Check it out and be sure to browse his gallery on deviantART. Sprites – There’s a new King of Dragons gallery with just the Player Select and ending sprites I added a few things to the Capcom World 2 gallery along with fixing that messed-up E. Honda portrait. I’ve spent most of my time fixing errors and making small changes to the site. Either search engines or people had been linking to discontinued sprite gallery pages that were still on the site until I made a clean re-installation of everything. I added some links to the 404 page that will drive people to the gallery index pages. I’m still converting old galleries to the new style, so I apologize for the hiccups you might encounter there. I’ll be taking a pause from updates during June. My brain is still a bit fried site overhauls, re-uploading and clearing the sites after getting hacked along with all the new material just to let you know that the site didn’t get killed off. I also need to get to work on some important artwork, the next Illmosis network site (which I was working on in March until the hacking happened). Luckily, July is the ScrollBoss site’s birthday month, so I’ll be secretly working on stuff for that. Teasers, previews and news will still appear in the site’s news feed here and the Tumblr. GFX Generators – You can now choose the font and palette in certain screenstyles that allow user-input text. 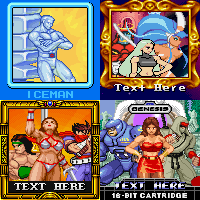 Not only does this add more palettes to the SFA3 font used in the old version, but it also adds 16 fonts of different sizes and a few have extra palettes as well. Not all of those fonts were complete and I filled in the gaps of missing symbols for a few fonts. Updated styles: “Avatar 100×100” and “384×224 scenes + text” in the GroupShot generator now have selectable font options, including font palettes. Some of the Avatar 100×100 frames will adjust the text to be in a better or more accurate position. The Mega Man 1 boss square frame will put the font where it’d be in the real game and the Genesis box places the text closer to where a game logo would be. The “Boxes, Flyer & Posters 160×192” now has an X-Box 360 style frame. 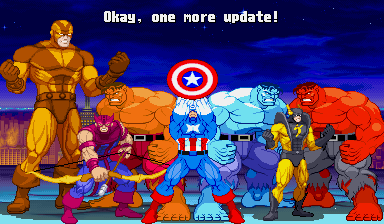 Updated characters: Anakaris (new sprite & palette), Felicia (new sprites), Iceman (more sprites), Lord Raptor/Zabel (new sprite), Marian (old 2002 KoF-style edit added), Strider Hiryu (added sprites & palettes), Sentinel (improved Mango Sentinel palette). The IREM character section was temporarily removed and Thomas/Vigilante was moved to the “Other Games” list (but he got the Vigilante and Japanese Spartan-X mini-logos for his trouble). All of the original Darkstalkers now have their vs. portraits from the first game. Custom Sprites – There is a brand-new gallery thanks to custom sprite donations from DNL. Check out his gallery, then visit his deviantART page to find even more work. Mini-Logos – Spartan-X added to IREM section. Streets of Rage (title screen style) added to Sega section. 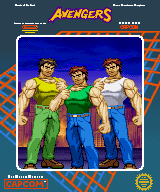 Double Dragon (arcade title screen style) added to Technos. I know that I had an update on Thursday, but I figured I’d add a few more things. GFX Generators What’s new in addition to yesterday’s update. Updated Characters: Yellowjacket sprite and Goliath mini-logo added to Ant-Man/Giant-Man character, Captain America (MSH GEM use pose), Hawkeye (new sprite edit), Hulk (new palettes, including Red Hulk), Iron Man (PROTON CANNON!!!). The Erik Josten version of Goliath (before he became Atlus) was added to the Other Villains character slot. Custom Sprites: One new Yellowjacket (Pym) sprite, one new Hawkeye pose & improvements on Loki. Mini-Logos: Goliath, Loki, Mandarin and Wasp. Those logos were added to their GFX Generator characters, too. If this is the first update you’ve seen this week, check out this previous post to see the much bigger update with new things in it. I hope you enjoyed these Avengers Week updates. I pretty much ran out of steam after my sinuses decided to explode on Thursday night, so I wasn’t able to make everything I planned to make. Have a good weekend! GFX Generators There’s a new group named “NEW” that has all the latest characters who were added or updated so you don’t have to scroll through over 100 characters to see all that newness. You’ll still find the characters in the normal places they’re supposed to be, but the NEW section is there for your convenience. 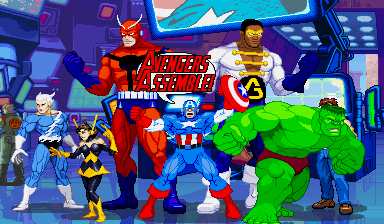 Marvel Characters: Ant Man/Giant Man (separate character with new sprites), Loki (all-new), Hulk (redone “original Hulk” edit), Quicksilver, Wasp (new sprites and many new palettes). Bill Foster/Goliath added to the Other Heroes character slot. Mandarin added to the Other Villains characters slot. 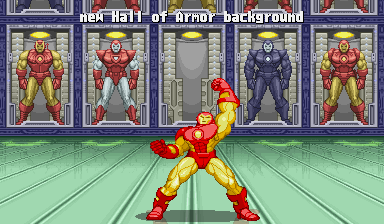 Screenstyles: A brand-new scratch-made Hall of Armor background was added to the “384×224 scenes” and “Avatar 100×100” screen layouts in the GroupMaker. That’s right. It’s Ryu and Ko from Capcom’s Avengers. Yes, even the version from the flyer with the white shirt is in there. Marvel Comics: new scratch-made sprites of Giant Man/Goliath/Black Goliath, Quicksilver, Mandarin and Loki. New outfit variations and shrunken sprites for the Wasp were also added. Capcom: Ryu and Ko from the old Avenger beat-em-up. The Avengers movie, this Avengers update and most of the Marvel-related items you see on this website wouldn’t be possible without one man who always deserves credit and thanks. If you’ve ever beaten Capcom’s Marvel Super Heroes game and wondered who Jack Kirby was, it’s time to learn. This post on Badass Hall of Fame says it all much better than I ever could, but let me give you the short version of it. Jack Kirby brought a sense of all-out action to comics. Most artists, good and bad, had poses that looked like you were about to see something happened or it already happened. Jack Kirby’s work is the pure happening. You can see that punch happening with the same brand of power you might see in some of your favorite sprites in video game attacks. Have you noticed how many games have animations where the Jab attack has the non-punching fist ready to deliver the next hit of the combo? You can find that in Jack Kirby’s fight scenes. While many people consider reality to be the end point of all creativity, Jack Kirby created a style and manner that is beyond reality nearly everything good about comics has a touch of that Kirby magic. 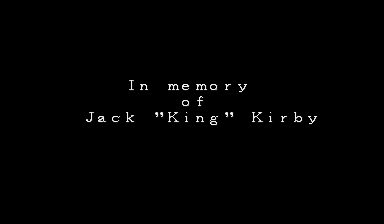 Take a bit of time to check out KirbyMuseum.org to see what I mean. Look at his fighting poses, then look at some of your favorite fighting game frames, especially Capcom CP2-era sprites.